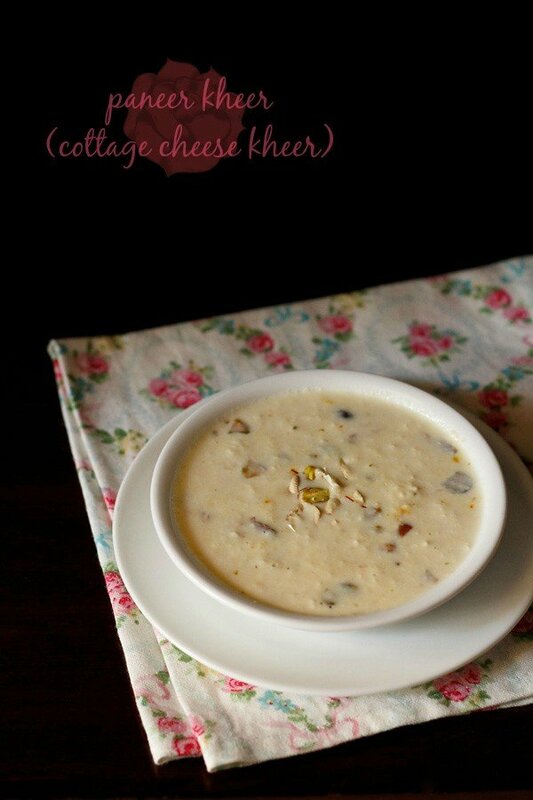 paneer kheer recipe - quick and easy cottage cheese kheer for the festive season. ready in less than 25 minutes. 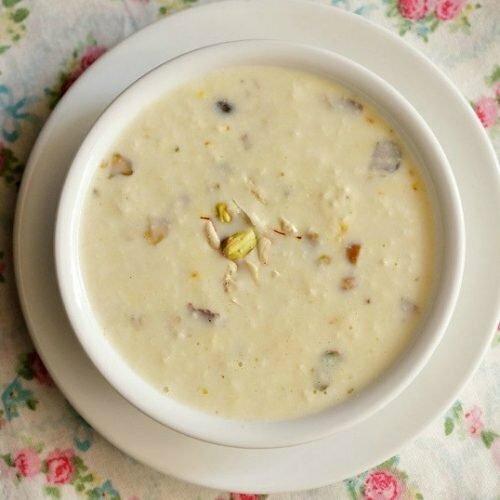 paneer kheer recipe with step by step photos – one more quick sweet dessert recipe of kheer, that can be made for navratri, dussehra and diwali. 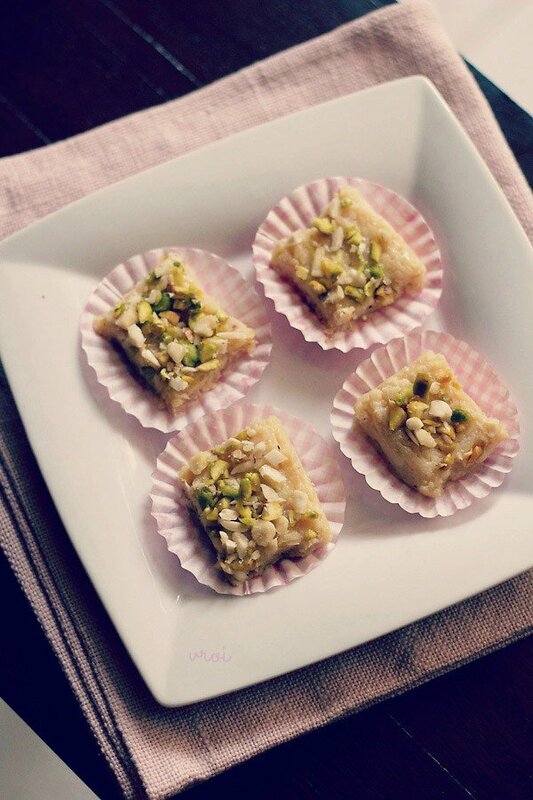 i plan to add some quick and easy sweets for the upcoming festive season. the paneer kheer is one such recipe that can be made in a jiffy and will be done in less than 25 minutes. 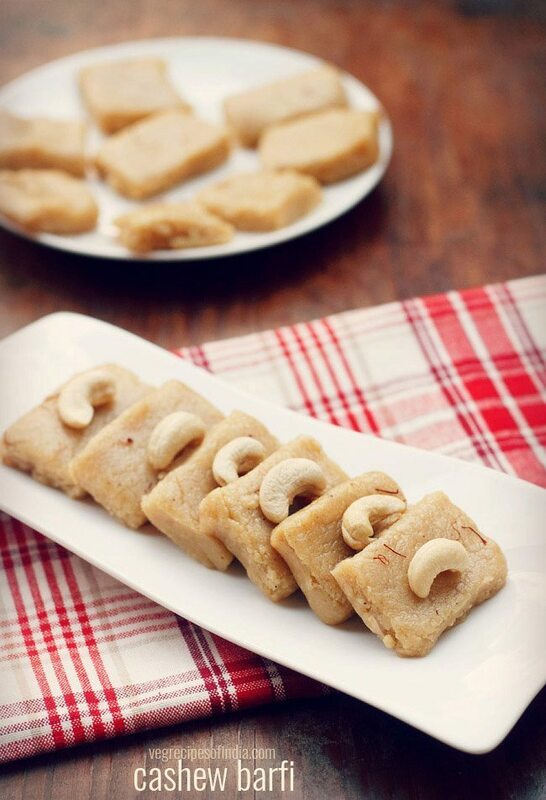 all you need is paneer and milk along with some dry fruits. the paneer kheer has been flavored with cardamom powder, saffron and rose water. 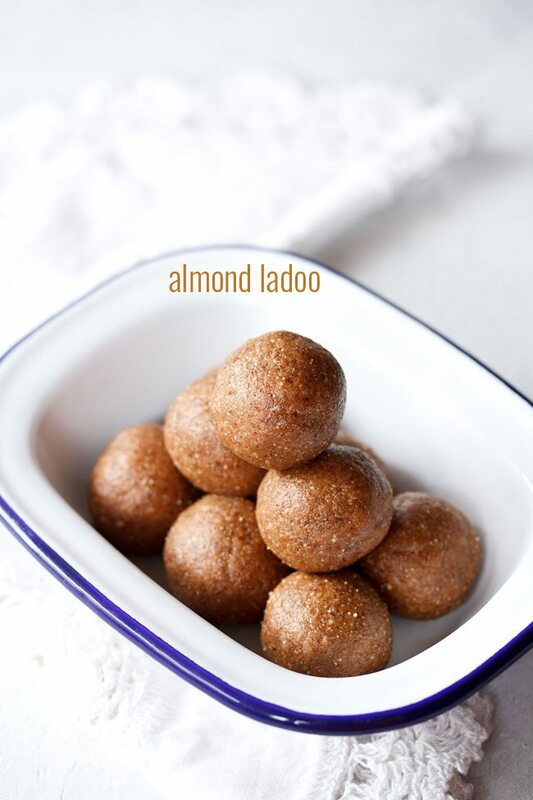 cardamom powder is a must. rose water give a beautiful rosy fragrance to the kheer. good to add it, but skip if you don’t have. saffron strands can be easily skipped if you don’t have these. you can also add your choice of dry fruits. always use fresh milk while making this kheer. the recipe tastes somewhat like rasmalai with soft succulent crumbled paneer in flavored & sweetened milk. 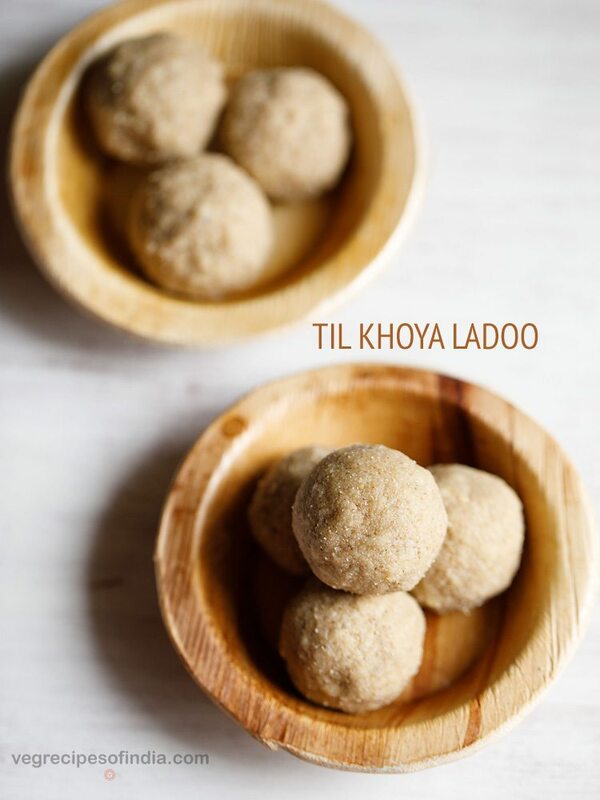 two more paneer based sweets in the blog are paneer barfi and gulab jamun with khoya. 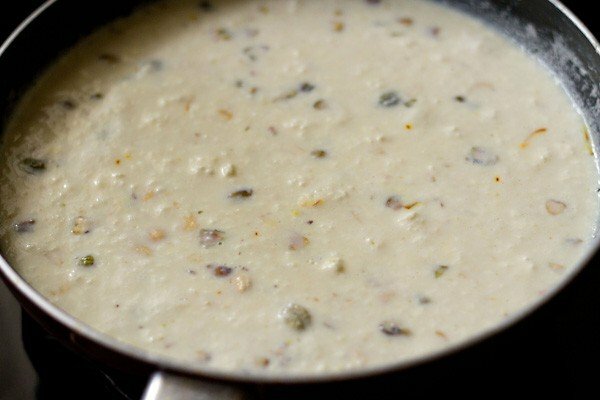 you can serve paneer kheer hot, warm or chilled. we prefer the kheer to be chilled. if you are looking for more paneer recipes then do check paneer butter masala, kadai paneer, matar paneer, paneer makhani and dry chilli paneer recipe. 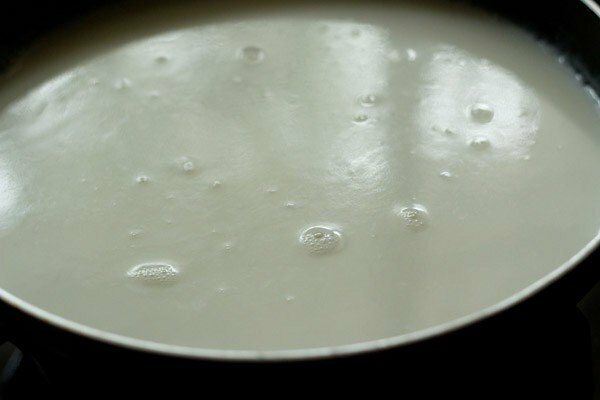 take milk in a wide bottomed pan or sauce pan and keep it on stove top on a low to medium flame. whilst the milk comes to a boil, crumble the paneer and keep aside. crush the cardamoms in a mortar-pestle to a fine powder. chop the dry fruits and keep aside. when the milk comes to a boil, lower the flame and simmer the milk till it thickens a bit. for about 5 to 6 minutes. 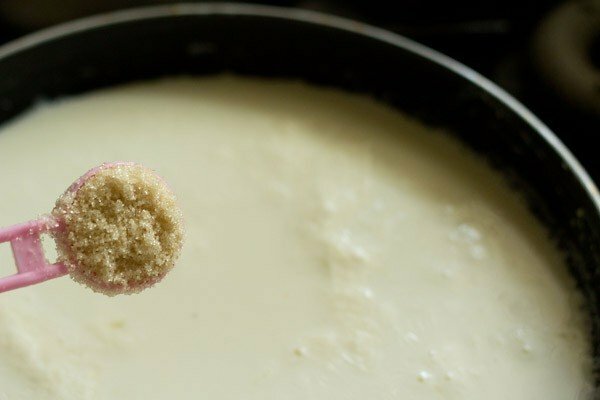 keep stirring the milk at intervals when its simmering. then add sugar and continue to cook further for 5 minutes. stir and then add chopped dry fruits (almonds, pistachios, cashews), cardamom powder and saffron. simmer for 1 or 2 minutes. add crumbled paneer. you can also grate the paneer and add. since i was using fresh chenna, i crumbled it. if adding refrigerated or frozen paneer, then you can grate it. if the paneer appears dry, then just soak it warm water and then crumble or grate. simmer for 2 minutes on a low flame till the crumbled paneer gets cooked. then add rose water & stir. 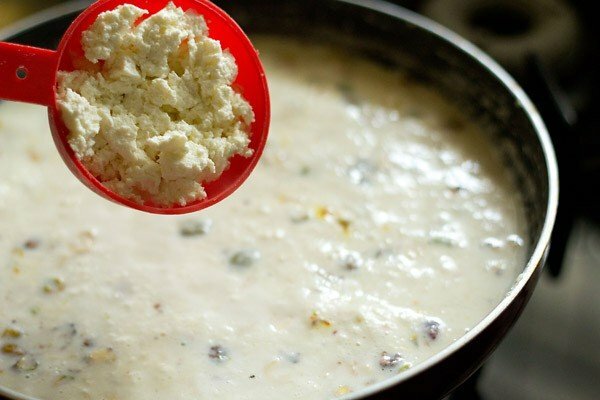 1. take milk in a wide bottomed pan or sauce pan and keep it on stove top on a low to medium flame. 2. allow the milk to come to a gentle boil. 3. lower the flame and simmer the milk till it thickens a bit. about 5 to 6 minutes. keep stirring the milk at intervals when its simmering. then add sugar and continue to cook further for 5 minutes. 4. stir and then add chopped dry fruits (almonds, pistachios, cashews), cardamom powder and saffron. simmer for 1 or 2 minutes. 5. add crumbled paneer. you can also grate the paneer and add. since i was using fresh chenna, i crumbled it. if adding refrigerated or frozen paneer, then you can grate it. if the paneer appears dry, then just soak it warm water and then crumble or grate. 6. simmer for 2 minutes on a low flame till the crumbled paneer gets cooked. then add rose water & stir. 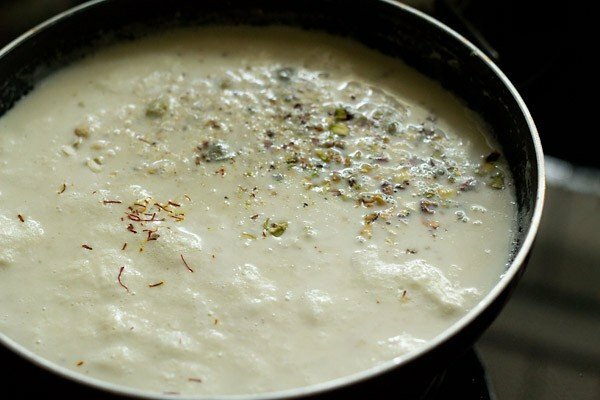 7. serve paneer kheer hot, warm or chilled. the kheer can be had plain and they also taste good with pooris. 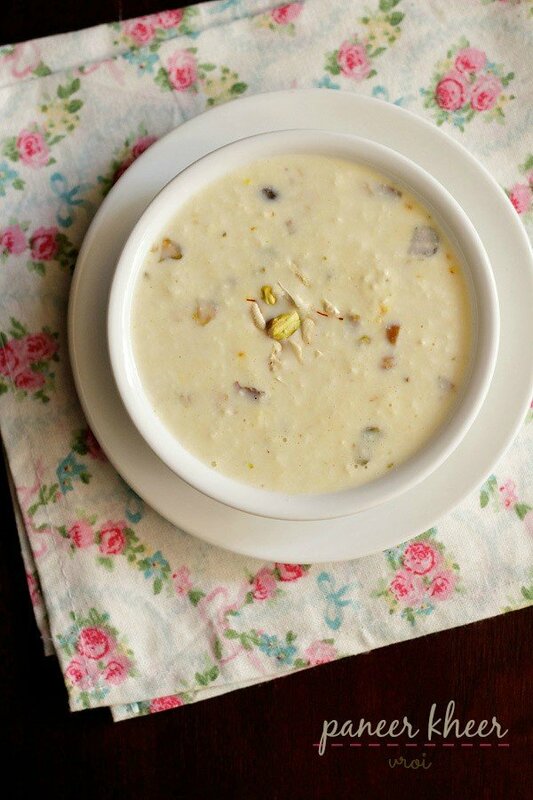 while serving you can garnish the kheer with few saffron strands or chopped dry fruits. 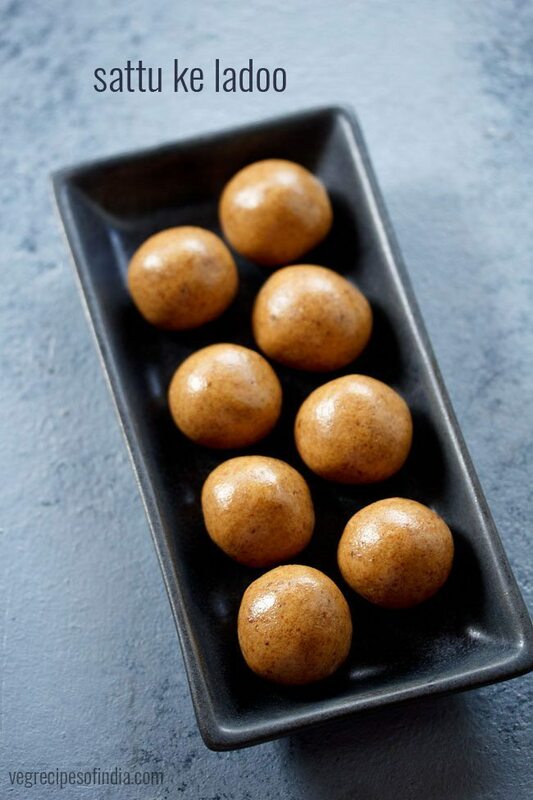 can jaggery be used instead of sugar? Maneesha, jaggery can curdle the milk. so if you add jaggery then add right in the end. We have tried 3 of your recipes – Punjabi chole masala, tomato chutney and paneer kheer. They came out really well. Thanks fo your efforts. All are nice recipes. Appreciate the way you patiently reply to all the comments 🙂 Love your blog..
Can d consistency reduced after adding paner.? I used frozen panner, d milk is ok, not spoiled, but didn’t get kheer consistency, it’s bit milky. ashwini, the paneer kheer consistency will not reduce after adding paneer. you have to first reduce the consistency and then add paneer to it. possibly the frozen paneer must have released water in the milk, there by thinning the consistency. Thank you, though bit thin, still my husband liked a lot. Amit you are a great chef! All of your recipes are wonderful!!! i really love your all recipe. one time in a week i try your recipe. thank you much nisha and happy cooking. This looks delicious. Can this be made with store bought paneer? you could make with store bought paneer mita but home-made is preferable for kheer recipe. Awesome recipe!! 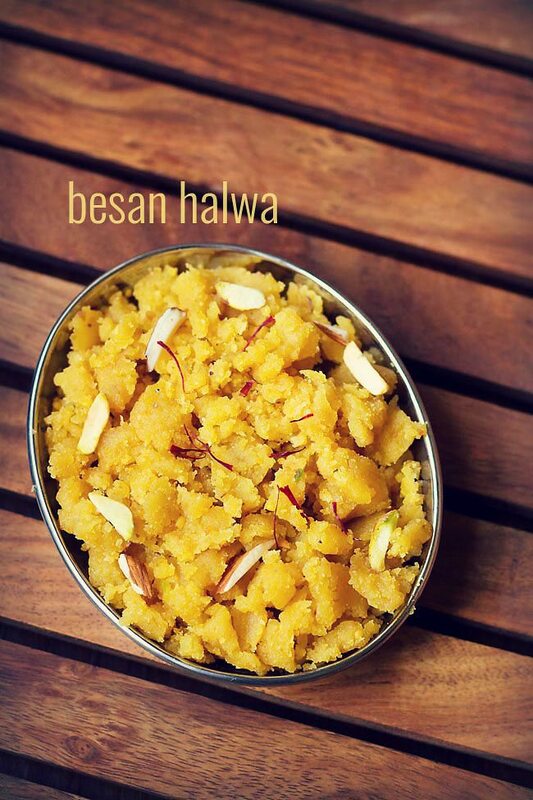 Thanks a lot for simple n yet tasty recipes…. Paneer contains salt in it. Is this a reason for milk getting spoil. sowmya, when you make paneer at home then there is no salt in it. outside paneer may have salt and that could also be the reason. 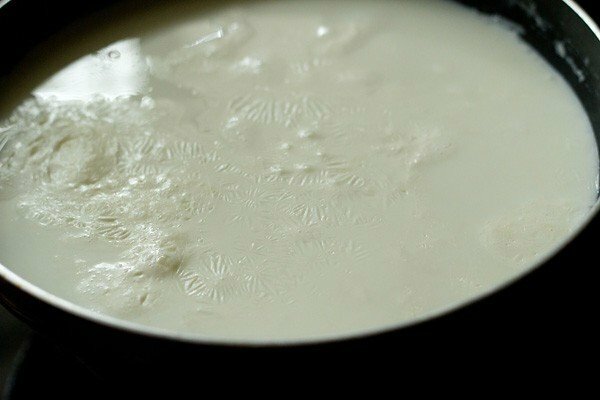 Hi I tried ur panner kheer recipe but milk got split when panner was added, so please may I know the reason what I may have done wrong.panner was brought from market. sowmya, its because the milk was on the verge of getting spoil or already spoiled. I tried the recipe & it was awesome. Thank you!! You are an amazing cook. Also, I really appreciate your dedication that you answer all our questions promptly. Keep up the good work. welcome priya. thanks for sharing positive feedback and kind words. Thnx for this wonderful recipe. Does the proportion of milk & paneer have to be exact? Can I add more or less paneer? welcome priya. yes you can vary the proportion and accordingly the consistency will change.